Here’s a story about why you should not trust seasonal forecasts. In mid November 2007, Vail was preparing for an opening day featuring very little snow. Some locals were concerned and the local paper wrote an article about the low amount of snow and interviewed a leading climatologist to get his take on the upcoming season. This expert made the following forecast: “This is going to be winter of low expectations… Count your blessings, whatever you get.” There you have it, one of the best scientists said there wouldn't be much snow for us to enjoy. Oh well, there goes the season. Or not. As if this were a Hollywood script, only two weeks after this quote was printed, the clouds began pounding Vail with powder day after powder day. 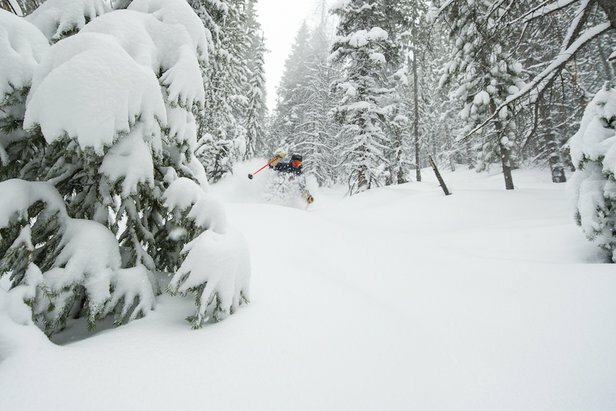 December and January featured 50 percent above average snowfall with top-quality skiing, and the season ended about 20 percent above average. So much for that seasonal forecast for low expectations. Now before you jump to the temping conclusion that this busted forecast is normal because all meteorologists are wrong, let’s explore a bit more about how forecasts are made and what type of forecasts you should trust. The forecast you’re most familiar with is a short-term forecast which makes a weather prediction from one to seven days in advance. While accuracy decreases with time, these forecasts are rather reliable. For example, a six-day temperature forecast now is as accurate as a three-day temperature forecast was 20 years ago. With each passing decade, weather predictions improve by one to two days. That’s pretty good! The key to the accuracy of these short-term forecasts is that they are made by very powerful computers. These computers ingest current weather data and solve complex physics equations to predict how the weather will change in the coming days. 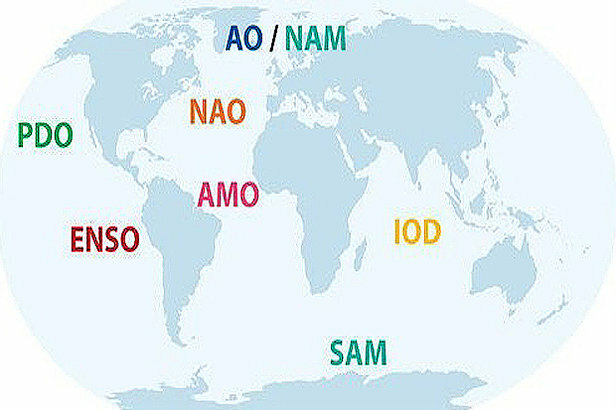 The maps show the acronyms and locations of major climate cycles across the globe. Each one affects weather in a different way, though using these factors alone will not guide you to your next powder day. The major climate fluctuations for the United States are: ENSO = El Nino Southern Oscillation; PDO = Pacific Decadal Oscillation; NAO = North Atlantic Oscillation; AO = Arctic Oscillation. Seasonal forecasts are made in a much different way, using statistics instead of computer modeling. Since the forecasts made by computers have very little accuracy after about 7 to 10 days, these same computers would be useless making a forecast for the next 3 to 6 months. So scientists use another method to create a seasonal forecast called “analogs”. Here’s how it works. Scientists first look for important climate factors that will be present over the coming months (more on these factors in a minute, I promise). Then they look for past years that had similar factors. Once these historical years are identified, they look at the resulting weather in those prior years and infer that the same type of weather will happen during the upcoming season. For example, if the upcoming winter has the same factors as the winter of 1996, then it’s likely that the upcoming winter will be similar to the winter of 1996. Some of the factors that scientists consider are El Nino or La Nina, the Arctic Oscillation, the North American Oscillation and the Pacific Decadal Oscillation. Each of these terms describes a tug of war within the atmosphere or the ocean, where one side is fighting for lower pressure or higher pressure, or cooler water or warmer water. The atmosphere and oceans are always trying to get into balance (not too hot, not too cold, not too high of a pressure, not too low of a pressure). However, they never really achieve this balance, so the tug of war continues indefinitely. After many decades of research, scientists have a large database of knowledge that tells them how these climate factors were positioned over the last decades or even centuries. This allows the forecasters to look back in history to find years that are most similar to the current situation and infer that the upcoming three to six months will be similar to what happened in those previous years. Unfortunately, this method of analog forecasting doesn’t usually provide accurate snow forecasts. While the past is a nice guide to the future, it’s not a perfect guide. Small changes in the track of each storm have a massive affect on where the snow falls. El Nino and La Nina are the best clues we have to what the upcoming season has in store. But even these factors rarely lead to a very accurate forecast. So when you spend time considering where the upcoming season will take you, don’t rely too much on the seasonal forecasts and instead play each storm as it arrives into that one to seven day window. If you had relied too heavily on the seasonal forecast for Vail during the winter of 2007-2008, there would have been more powder for the rest of us. And that would have been a shame (for you! ).